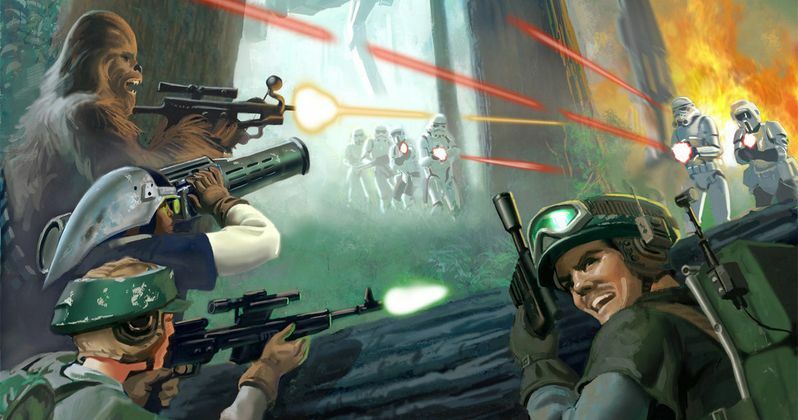 Will Han, Luke and Leia be returning to Endor? That sounds more and more likely as a new report reveals a huge fight sequence took place in the forest. Star Wars: Episode VII is continuing to shoot in various areas around the globe, with Total-Geeks describing one scene that is set in the Whales location Forest of Dean, where a large woodland battle featuring thousands of extras took place. The sequel shot in the Forest of Dean for a little over a week, with director J.J. Abrams and his cast and crew staying at the Celtic Manor Resort, a luxury, five-star hotel. They were shuttled back and forth between a location known as Puzzlewood, where stars John Boyega, Daisy Ridley, Adam Driver and Pip Anderson all participated in the shoot. Kathleen Kennedy reportedly visited the set a number of times, and quite a few business meetings took place inside the hotel. There, the crew was overheard discussing the tone of this sequel, with J.J. Abrams and his team aiming to differentiate themselves from Marvel and Pixar, which also are housed at Disney. They are hoping for a more 'unified, cohesive tone with the sequel movies'. This goes against what Marvel is currently doing, which tends to 'mix and match different film styles'. Reporter Ryan Leston took a photo of himself with the director to prove he was there (CLICK HERE). He claims that J.J. Abrams was quite tight-lipped about what was actually being shot in Puzzlewood. It is not known if the location is standing in for Endor, or is a different forest planet. Ryan Leston did claim to ease drop on some of the conversations had during the crew's stay in Whales. The film is using real living actors as extras as opposed to CGI, and there are a lot of them. Just this one scene is reported to have used thousands of men and women. The woodland battle is said to be epic in scope. It also includes a very pivotal fight scene amongst some of the new main characters. No character details were uncovered, but stunt doubles for John Boyega and Daisy Ridley are said to have been put through quite a workout. Pip Anderson is believed to be involved with the fight scene because of his parkour skills, but it is not known if he is playing a hero or villain. Total-Geeks claims that the vibe on set was unusually upbeat, with the actors having 'a blast'. Even director J.J. Abrams was visibly excited about the scenes being shot at Puzzlewood. What do you think? Are you excited about this forest battle? Are we going to return to Endor?